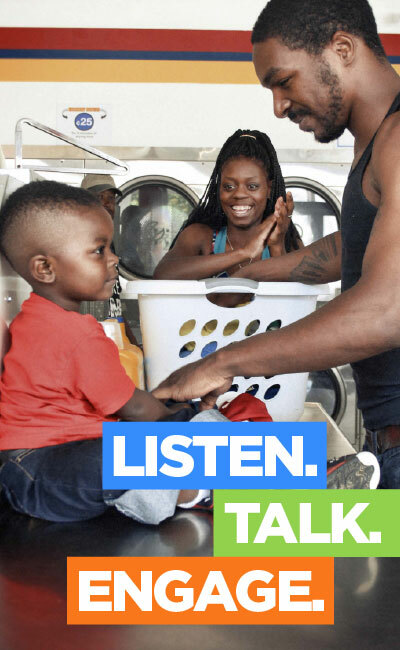 Spread the Word is a language building initiative in the Atlanta neighborhoods of Vine City and English Avenue. We are starting this program in the Vine City/English Avenue neighborhood with the goal of reaching families, educators and business owners to make a positive difference in building strong vocabulary in young children. Studies show that the more words young children hear and understand by 3 years of age, the better they are able to perform in school and the more successful they are in school and in life. Through fun, engaging, and interactive activities and programs, Spread the Word is designed to build meaningful vocabulary by working with families and the community to educate and empower individuals to expand vocabulary and pass that knowledge on to their children. Family Workshops: Children and their parents will participate in a weekly, two-hour program to learn together through story time and science and art activities. Each family will receive language/vocabulary backpacks with books and other educational materials. Interactive Vocabulary Kiosk: Located in the Children’s Museum, the permanent, interactive game will help build vocabulary skills through language games related to museum exhibits. Professional Development: Coursework and online training for educators and adults working with children in early learning centers throughout the communities. Books and Brunch & Mobile Library: Neighborhood families will be invited to attend club meetings, an ongoing Community Story Program, and the Museum will operate a mobile library to reach additional communities. Museum visits and family festivals: The Museum and community partners will offer free and discounted admission to several community events and family festivals. We would like to thank the PNC Grow Up Great initiative for their constant support of Spread the Word! If you would like more information about the Spread the Word program or would like to participate, please contact us!